Manchester United superstar Alexis Sanchez has surprised fans with one of his recent Instagram posts, the attacker has been ruled out for the rest of 2018 according to The Guardian. On Thursday Sanchez took to Instagram to give United fans an update on his injury – sporting a device wrapped around his leg that will hopefully aid his recovery and get him back in action sooner rather than later. Eagle-eyed fans noticed that Sanchez has two identical pictures of himself along with his dogs Atom and Humber – framed next to each other. Everyone is well aware of Sanchez’s love for his dogs – the Chilean has even set up an Instagram account for his pets, which has a whopping 185k followers. 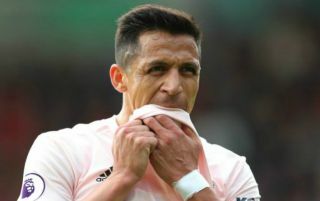 Sanchez is understood to only socialise with a few of his United teammates like David De Gea, Juan Mata and Romelu Lukaku according to a damning report looking into Sanchez’s poor form since switching to United from Arsenal. The report was published by The Times here.